It’s that time of the year again so I’m in the mood for pumpkin. 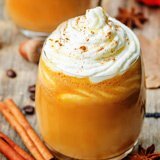 I’m addicted to smoothies and always looking around for different recipes, so decided to try a pumpkin banana smoothie. Many smoothies are strictly summertime drinks. Refreshingly cool and energizing, they are designed for the warmer months. But as the temperature drops, we begin to crave something more substantial. Hot, warming pies, breads and cookies straight from the oven tempt us with their spicy aroma. And it’s so easy to over-indulge. Now I’m not saying you should never treat yourself to the odd pumpkin pie or cookie. Certainly not. 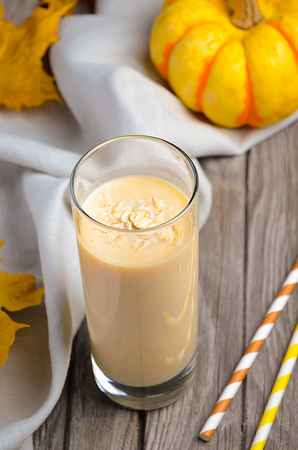 But if you love the taste of pumpkin, a much healthier way to indulge that craving is with a pumpkin banana smoothie. It’s the same flavors, just colder and in a glass. Always use frozen banana when making these smoothies. Frozen banana makes them smooth and creamy with a sweet, vanilla-like flavour. 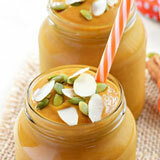 Enjoy these smoothies as a liquid breakfast or as a delicious end-of-meal dessert. This is a thick, creamy smoothie and is substantial enough to be a meal replacement. Would easily serve two. 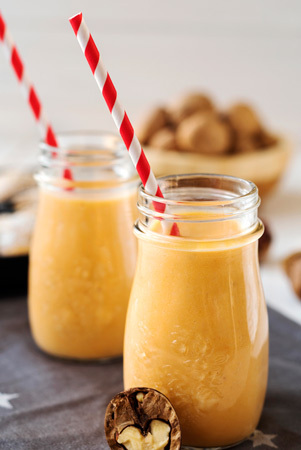 Blend together the pumpkin puree, frozen banana, almond butter, almond milk, medjool dates, cinnamon, nutmeg and ginger until smooth. Serve in your favourite glasses. 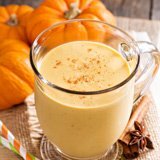 Add the pumpkin puree, frozen banana, vanilla yogurt, almond milk, pumpkin pie spice and vanilla bean paste to the blender. Blend until thick and creamy. This recipe makes two very large glasses. Add all the ingredients to your blender and whizz on high until smooth. Pour into serving glasses.